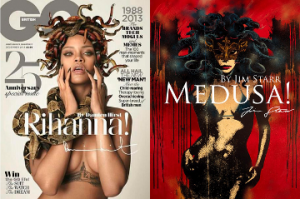 Near right is the December 2013 cover of GQ magazine, Rihanna Medusa photographed by Mariano Vivanco in a shoot directed by Damien Hirst. Far right is the most recent of a series of Medusa images first created by Jim Starr in 2010. And Charles Caleb Colton? He coined the phrase ‘imitation is the sincerest form of flattery’. Cheers Damien.